I am so excited today to share a wonderful idea for you that I have been using all year! I got this idea from my sweet friend Catherine who blogs over at The Brown Bag Teacher! She posted about how she organizes her math and reading rotations on Instagram earlier this year and I immediately knew I wanted to do something similar in my classroom. After talking about them with Catherine, I came up with class rotation schedules to use with my students. I loved how clean and clear the layout was and I was ready to switch up my old system of keeping track of rotations. We do rotations throughout the week during spelling, reading, and math. You can read more about our weekly reading and language arts schedule here. We usually do a version of the Daily 5 three days a week. Like Gale Boushey and Joan Moser (aka The 2 Sisters) note, Daily 5 is meant to be adapted to your classroom and schedule. So although I don’t do everything the way they lay it out, I have found a method that works really well for my students and me! You may have to switch things around and find a way that works for you and your students! 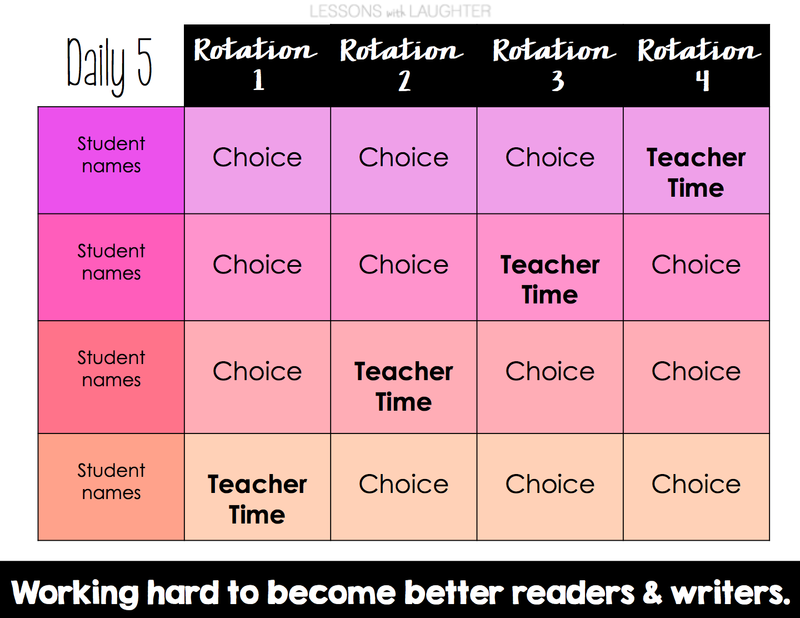 One way that I have adapted the Daily 5 for my classroom is that we do four rotations a day instead of five. This ensures that students have enough time at each rotation to work on what they are doing. Also, I use Words Their Way for spelling, so on Monday when students see me during “teacher time,” I introduce their spelling words for the week and do the initial sort. 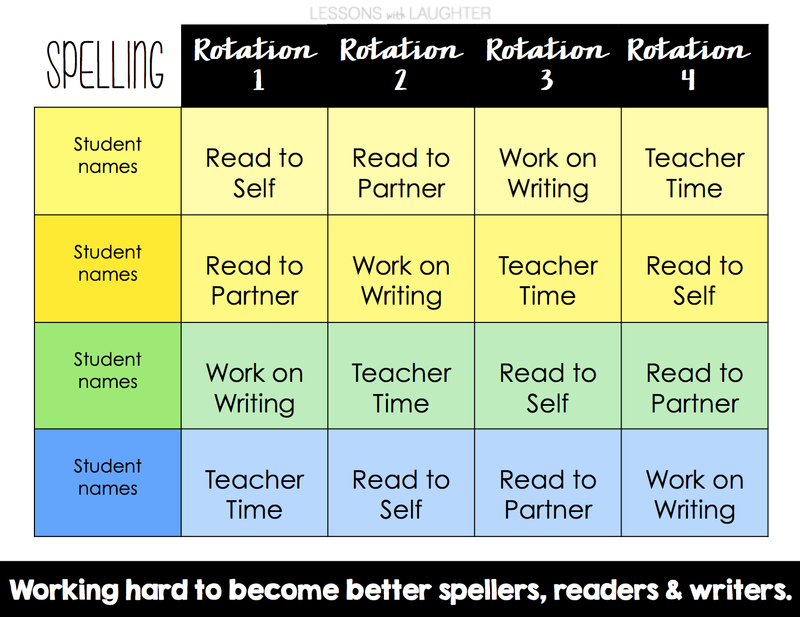 We call these Spelling Rotations, which are different from our regular Daily 5 rotations because the students are in different groups for reading and spelling based on their reading/spelling levels. These change frequently throughout the year and I move students to different groups as the need arrises. 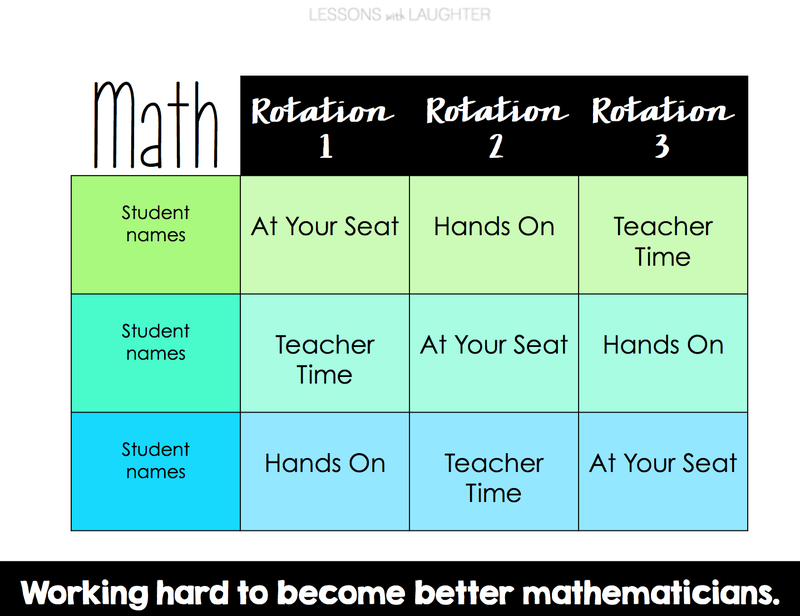 Also worth noting, when we do math rotations I have my highest group start at rotation 1: “at your seat.” For us, this means that they start their math homework. We currently use Saxon math, which gives students 30 spiral review questions to do for homework every night. Since that would take way too much time for them to do it all at home, I give them time to work on it during class with a partner. My above grade level group starts on their homework before they meet with me for teacher time. Since the homework is spiral, many problems cover material that we have previously learned, so they are able to complete most of it prior to the lesson. If they come to a problem that is something we will be covering that day, they skip it until they have done the lesson with me. The thing that I love most about the Daily 5 is that you can structure it to fit your classroom. You can start by telling students which rotations to do when, and work up to giving them choices, or you can start with choices from the beginning. If you have a smart board or another way to display this rotation schedule electronically, it is nice because you can make changes as often as you would like to your rotation schedule. If you don’t have access to that, you can always just print these off and display them under the document camera, or hang them up for the class to see. They not only keep students on track, but they also help me know which group of students I will be seeing at which rotation. I’ve created an editable file for you to adapt to fit the needs of your classroom! You can change the font, colors, columns, and text to whatever you would like! You can access it by clicking on the picture below! For the fonts to show up correctly when you open the Powerpoint, please download and install these fonts on your computer prior to opening the presentation! You can see how Catherine uses her version in the primary grades by visiting her blog post at The Brown Bag Teacher. Thanks so much Kathie!! I'm so glad you can use it! I feel the same way… I always love reading your blog and all your fabulous ideas!! And yes on ordering Words Their Way!! I love it!! I will work on a post this summer! And I am SO excited to meet you in Vegas this summer!!! 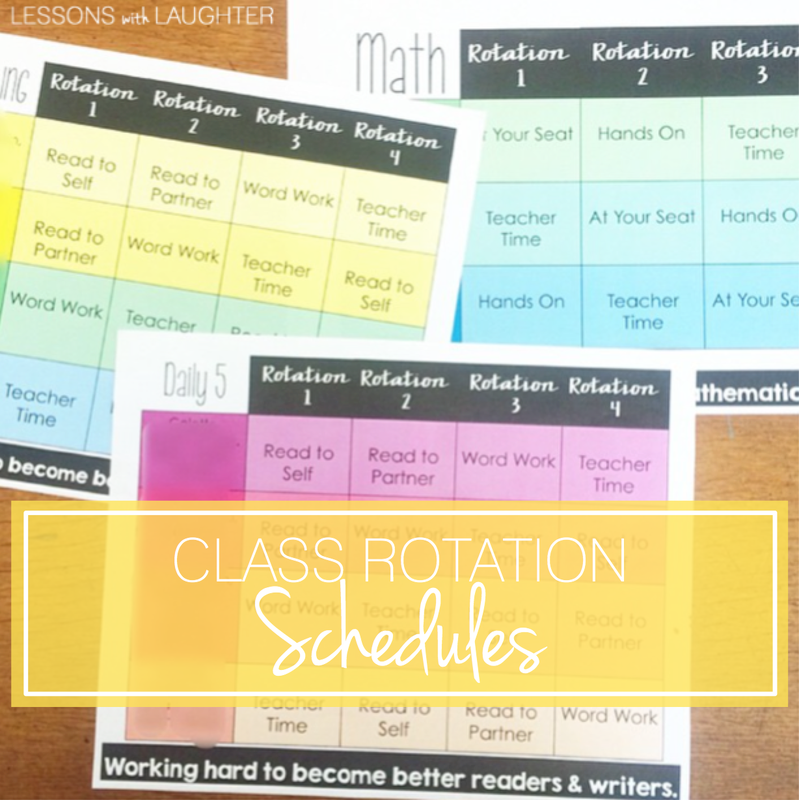 What a great idea to keep rotations organized! Thank you for sharing this. So I know that you do an hour block for Spelling/Lang. Arts, but what about for math rotations? Hi Lauren! We have about an hour a day for math as well! I spend about 20 minutes per group when we do math rotations, which gives me time to teach the new concept and reinforce other skills that group needs help with or provide enrichment opportunities to my group that is above grade level!